If only the Victorians had thought of Woodland Burials! Which of these places would you choose as your final resting place? 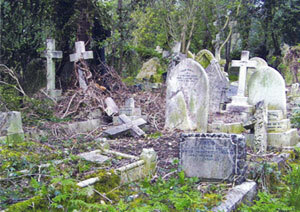 Picture if you will rows and rows of characterless headstones, many of them crumbling and broken, many others unkempt and all of them squashed into a faceless cemetery or an overcrowded churchyard. This is the common perception of a British graveyard – a very uninspiring place in which to remember our loved ones who meant so much to us. Compare that image to a woodland. Through all the changing seasons the beauty of nature is timeless. The vibrant green and blossom of the spring, the cool, dappled, leafy shade of the summer, the stunning blaze of colours in the autumn and the fascinating patterns of the bare branches in the winter. With a myriad of wildlife making its home in a friendly environment, amongst the trees on a carpet of old fashioned wild flowers. Which of these places would you choose as your final resting place? If your choice is the woodland, you will be glad to know that this option is available and is generally less expensive than a graveyard or cemetery. You will also be reassured to learn that woodland burial grounds will remain as such in perpetuity, unlike most cemeteries that may eventually be re-used or developed. 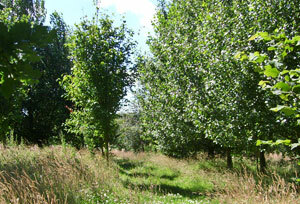 Our Woodlands of Remembrance provide a very positive way in which to put life back into the environment following a death. The planet needs more broadleaf trees to help stem the deterioration of our atmosphere. It also needs more habitats for our our wildlife and insects and more undisturbed land for our rapidly disappearing flora and fauna.